I have always found the entrepreneur an intriguing character. Growing up in the 80s and 90s I held a fascination with figures such as the nerdy but supremely wealthy Bill Gates of Microsoft, or Britain’s own charismatic and adventurous Richard Branson. They have wealth, control and the confidence that comes from knowing that they made it all happen themselves. Most impressively, entrepreneurs often use their self made fortunes to attempt to benefit mankind. Bill Gates intends to give away most of his billions to help cure disease and Elon Musk, founder of SpaceX, Tesla and Paypal, wants to colonise Mars within our lifetime. Before entering medicine, I would wonder if one day I might become an entrepreneur. Of course, I’m now contented and settled in my role helping my patients as a GP. But I still have respect for the entrepreneur and for startup culture. They are inventive, creative, hardworking and prepared to fail fast and fail often until the problem is solved and job is done. Healthcare is facing a perfect storm of challenges. The list is familiar; increasing patient expectations, older and more medically complex populations, availability of more but higher cost treatments, and shrinking or static budgets. 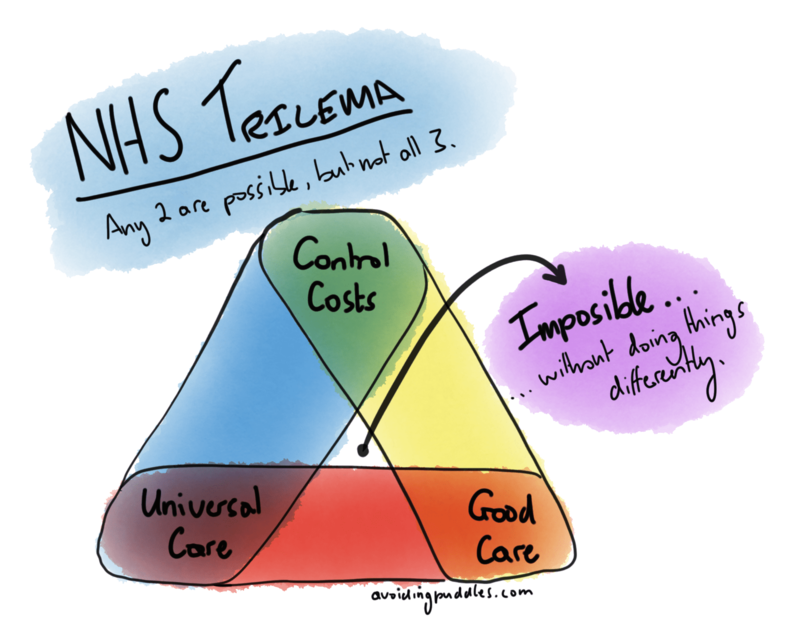 To continue to deliver universal care, good care and to also control costs, we will need to do things differently. Many believe that medical entrepreneurs and startups can help us face these challenges by using new and emerging technology to find innovative solutions. To allow us to improve care, control costs and treat everyone. To let us have our cake and eat it. With these hopes in mind, I joined a hundred or so other medical, technology and financial professionals at the Doctorpreneurs day conference at St Thomas Hospital London on Saturday 5th November. It was a great opportunity to listen, talk to and study that fascinating species, the Doctorpreneur. Over the next 5 weeks I will take you back to anatomy class and we will peel back the skin and take a look at what is behind a doctor led medical startup. Anatomy of a Doctorpreneur ⅕ – The Founder – Read here! Anatomy of a Doctorpreneur ⅖ – The Idea – Read here! Anatomy of a Doctorpreneur ⅗ – The Team – Read here! Anatomy of a Doctorpreneur ⅘ – The Funding – Read here! Anatomy of a Doctorpreneur 5/5 – The Pitch – Read here! Who becomes a medical startup founder? The medical startup founders on show were a varied bunch. A wide range of specialities were represented, but interestingly, surgical specialties and GPs were in the majority with medical disciplines somewhat underrepresented. Speakers had started their journeys as entrepreneurs at many different stages of their careers. Some, such as Dr Naeem Ahmed, founder of healthmakespace and Selfless, started whilst they were medical students. Others have become established leaders in their field before emerging as entrepreneurs. Mr Shafi Ahmed FRCS is most famous for being the first surgeon to live stream an operation using google glass. 13,000 students from 115 countries watched as he performed a liver and bowel resection in 2014. He has gone on to found initiatives exploring the use of Virtual Reality and other technologies in medical training through his company MedicalRealities. Great networkers, able to form connections and relationships to help access help and move their projects forward. Cultivating interests in or at least enjoying close connections with people possessing experience of sectors outside medicine. Enthusiasm for technology or housemates, partners, friends or family with connections to the IT, business and legal worlds were a common theme. Perhaps most importantly, they describe a passion for creating their company. Everyone has ideas. I’ve had a few good product ideas myself (well, probably). But very few people actually put in the hard work and commitment to try and make something of them. In this sense none of the founders were accidental entrepreneurs. Certainly, most tell stories about the origins of their idea or company. These often involves a simple connecting of dots, or of stumbling upon a solution to a tough problem, followed by bumping into the right people to make it happen. However, my suspicion is that many of these creation stories have become well practiced parts of the pitch, crafted to help people understand their idea and product and believe in the team. I think that the desire to make a bigger impact comes first. There were few accidents. They had ideas AND the desire to create something and make things happen. For some entrepreneurs, it seems a good idea became a business and for others it seemed they set out with the intention of using enterprise and technology to improve health and then found the right idea came. The issue of how to balance life working as both a medic and an entrepreneur came up again and again. This was a common problem faced by many of the founders. When a founder continues work in medicine, investors tend to worry about their commitment of time and energy to the company. On the other hand, some medical colleagues become concerned about issues such as completion of training, becoming deskilled or failing to achieve their promising potential in medicine. Hospital managers and colleagues can be unsympathetic to part time work. However, it seems that most founders eventually find what is right for them. Some speakers were continuing to work or train in their specialities. Many had taken career breaks to get their companies off the ground. Some had left medicine entirely and allowed their validation to lapse, and seemed happy with this. For those who stopped working in medicine, feelings about identity sometimes became an issue. After putting her surgical training on hold to work on the company, Doctor Stephenie Eltz, a co-founder at Doctify, described feeling a loss of part of her identity. On the other hand Dr Jamie Wilson, made an early decision to leave the NHS. He left psychiatry training in 2008, completed an MBA and spent time working in Silicon Valley before founding MyHomeTouch. He still identifies as a doctor. Advantages of being a doctor and a founder? It seems it can be easy to underestimate how useful medical training and “insider” knowledge of NHS structures and systems are to a medical innovation startup. During the lunch time pitching competition, Dafydd Loughran, a surgical trainee from Wales, described SurgicalConsent, a product designed to standardise and improve the quality of preoperative surgical consent procedures. All the medics present had been in difficult positions as junior doctors, taking handwritten consent in a rushed environment for unfamiliar operations. The problem being addressed and the benefits, both for patient care and reduced litigation were obvious to those of us with a medical background. However, most investors and tech types had difficulty grasping the opportunity. Medical training and serving time on the “frontline” allows medics to see the opportunities and also to get the inside knowledge, insight and contacts needed to take things forward. But, medics must remember that they have large blind spots in other important areas. Cupris founder, Julian Hamann, recommends that doctors starting companies “Get some sort of business education”. He has completed an MBA and found it useful in converting some of his unknown unkowns into known unkowns. The main advantage of being a doctor and the founder of a medical startup is that perhaps the most important and hard to find member of the team is already on board. Medics willing to dedicate time and energy to a new and unproven company are few and far between. Medical companies can struggle to achieve credibility in the industry without a Doctor on board. Once a doctor is resolved to become an entrepreneur, they will need to develop their idea. Read part 2 – The Idea here. They will need to access skills from not only medicine, but also the worlds of technology, law, finance, business and more. This will involve bringing others on board to form a team. Next, they will need to begin pitching their idea to attract customers and investors. I will reflect on what I heard at the Doctorpreneur event on these steps in the upcoming posts in this series. If you want to learn more about founding a medical start up, taking your idea to the next level, or getting involved in the digital health revolution, then the Doctorpreneur website is a great place to start. Please look out for the next articles in this exciting 5 post series about medical startups. I hope you enjoyed this post. Please share with friends and colleagues, follow me on twitter and leave a comment below. Unusually for my blog, I have named and quoted a number of the great people I met or heard speaking at the Doctorpreneurs event. If you are one of these people and you would like me to correct information or remove a reference to yourself, then please contact me and I will do this.